When the sun is shining and the temperature gauge keeps going up, cool, refreshing food is what we need. 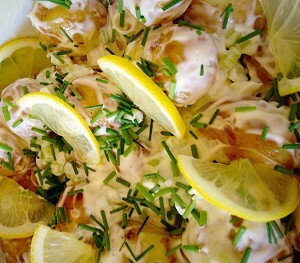 So my Tangy Lemon Potato Salad is perfect, cool and refreshing with a hint of crunch. 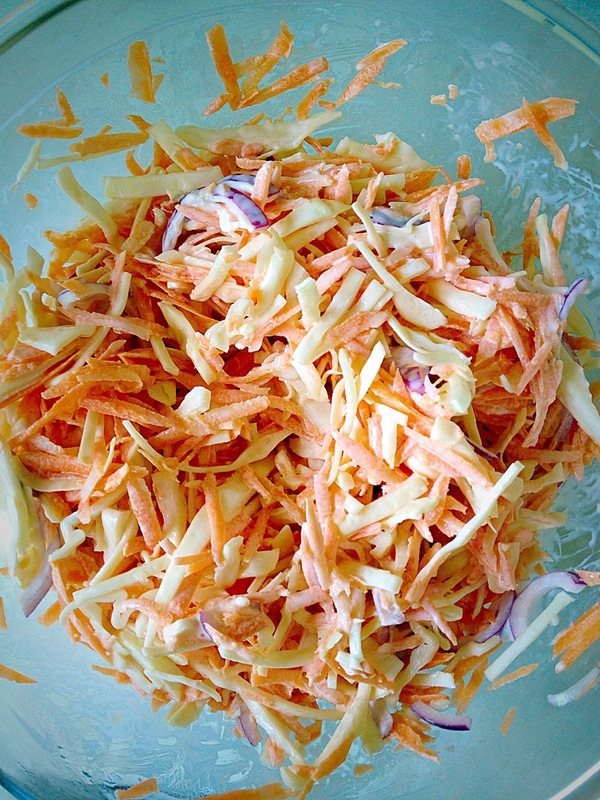 Also this is the perfect side dish to, well, just about anything! We’re having this with fish tonight. While my Tangy Lemon Potato Salad does have mayonnaise in the sauce, you can easily substitute a light/lower fat mayo. 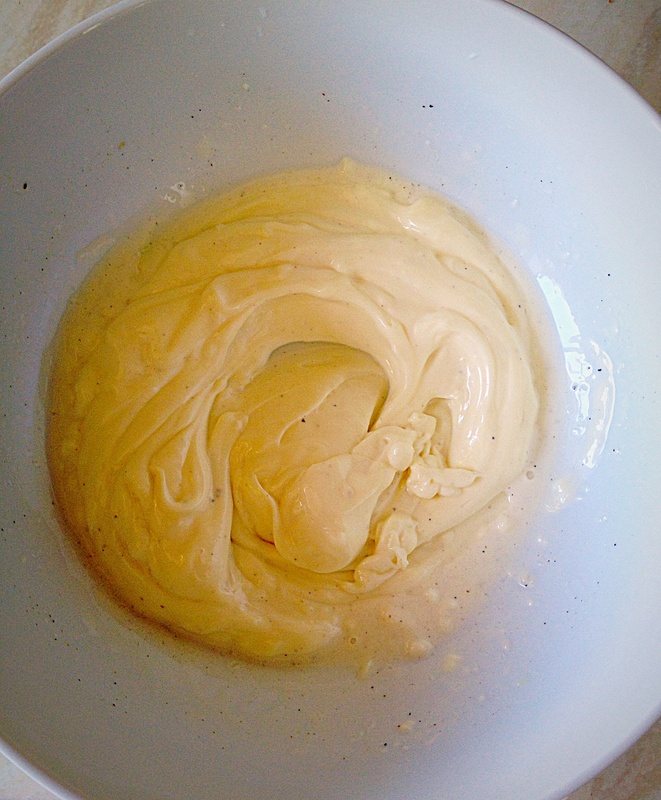 The mayonnaise is thinned down with the juice of a whole lemon. And it’s this zesty juice that permeates the warm potatoes so that once chilled they take on a tongue tingling tang. Also at the same time it stops the mayonnaise from becoming gloopy. 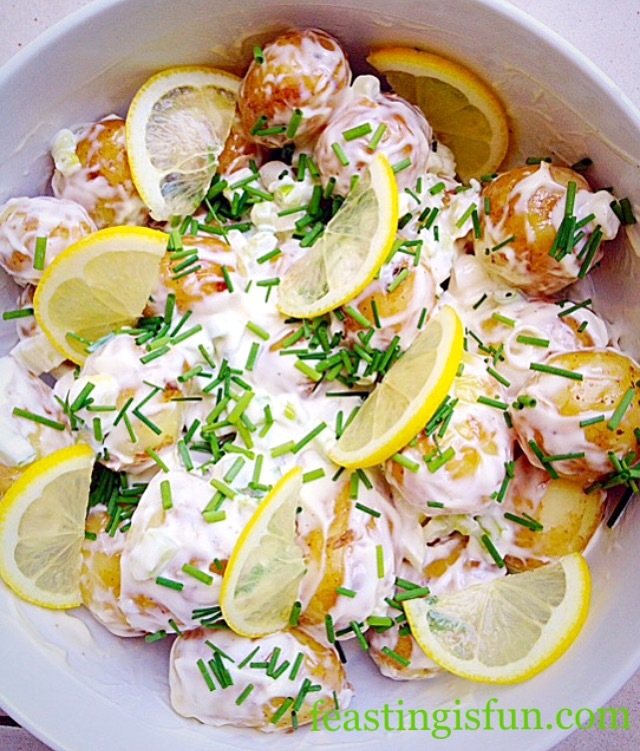 Tongue tingling Tangy Lemon Potato Salad. 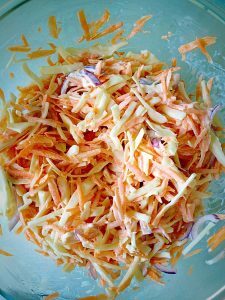 If, like me you’re organised, cooking the potatoes and getting this salad made first thing in the morning, or even the night before, not only allows all the flavours to merge together, but you are also guaranteed a cold salad. Resulting in a side dish that works well with hot fish, quiche and any number of dishes including barbecues. Also it is ideal as part of a cold meal, buffet and picnic. 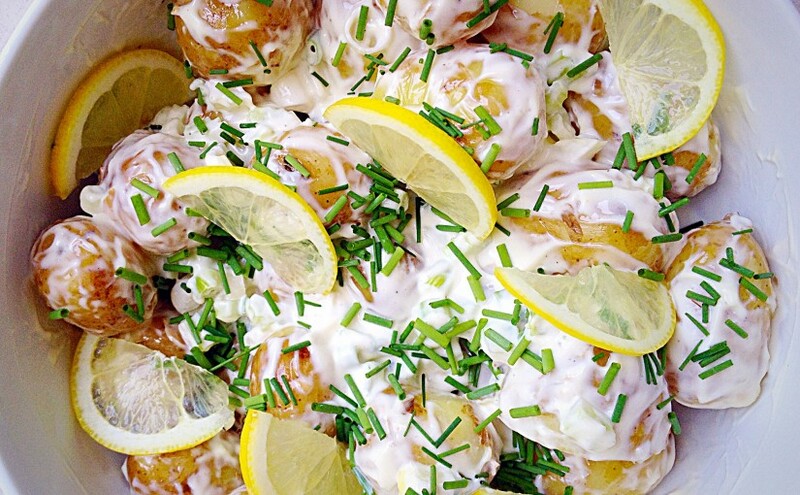 Wafer thin slices of lemon add extra texture to this Tangy Lemon Potato Salad. 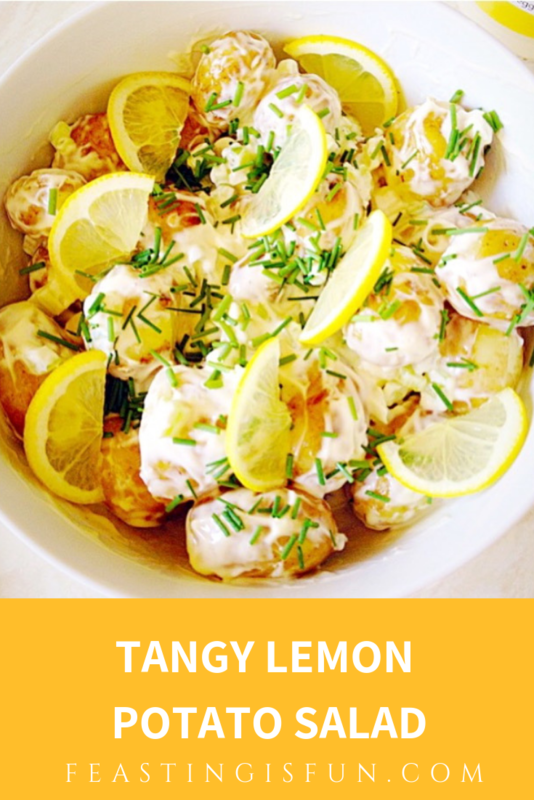 So I can guarantee that once you have made this Tangy Lemon Potato Salad you will want to keep making it. Especially if you take it to friends and family to share. Easy to make and perfectly portable! 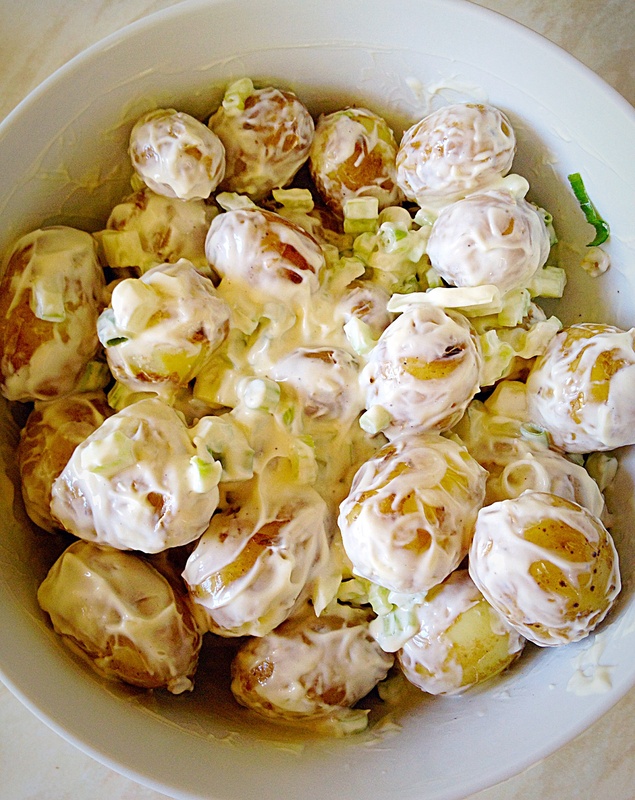 Recipe : Tangy Lemon Potato Salad, serves 6 as a side dish. First of all, scub the potatoes to remove any dirt. Cut any larger potatoes in half so that all the potatoes are roughly the same size. Place the potatoes in a saucepan, cover with water and bring to the boil. 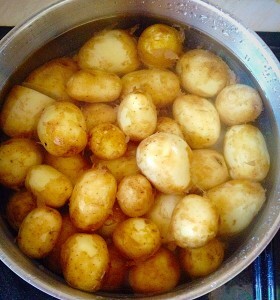 Simmer the potatoes until just tender, drain, return to the pan and leave with the lid on, to finish steaming for 20-30mins. In a bowl add the juice of one lemon, mayonnaise, salt and pepper. Drain the potatoes and leave to steam dry in a colander for 5 minutes. 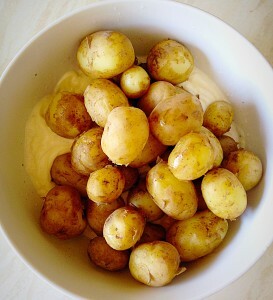 Add the potatoes to the bowl. Chop the spring onions and celery into small dice. 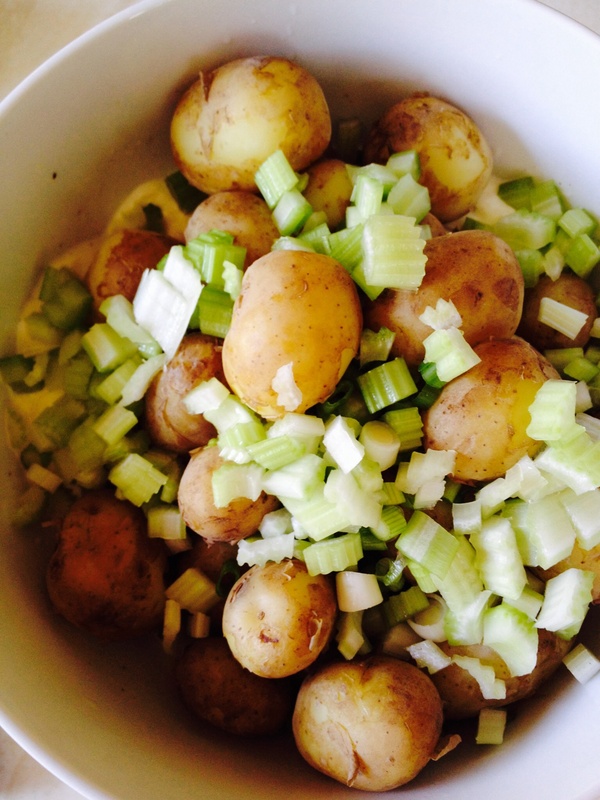 Add the chopped celery and spring onions to the bowl. Give everything a gentle mix. Snip the fresh chives over the top, taste and adjust the seasoning as necessary. 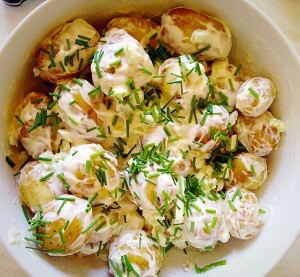 Finally, if you prefer you can serve the Tangy Lemon Potato Salad as it is. Although I like to jazz it up with a few, very finely sliced lemon halves. Because they are perfectly edible (although if you just want to use them for garnish that’s fine) and taste delicious. Also the sliced lemon let’s people know that there is lemon juice in the potato salad. 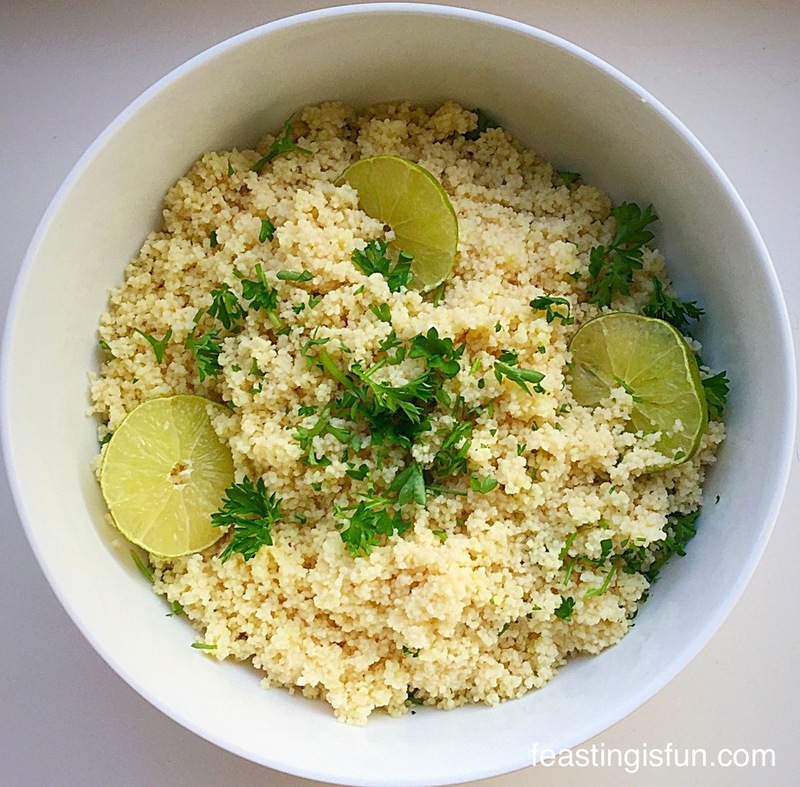 Thinly sliced lemons add to the visual appeal of this salad. Make this Tangy Lemon Potato Salad up to a day ahead. Store in a bowl wrapped in cling film and keep refrigerated. Eat within 3 days. Lemons give a fresh, zesty, citrus burst to any dish they are used in, whether sweet or savoury. And a particular favourite of ours, here at home is Lemon Thyme Roast Chicken followed by Lemon Ripple Ice Cream for dessert. Sharing a feast around the table as a family is an important part of our lives. I love the tangy flavors in this potato salad. 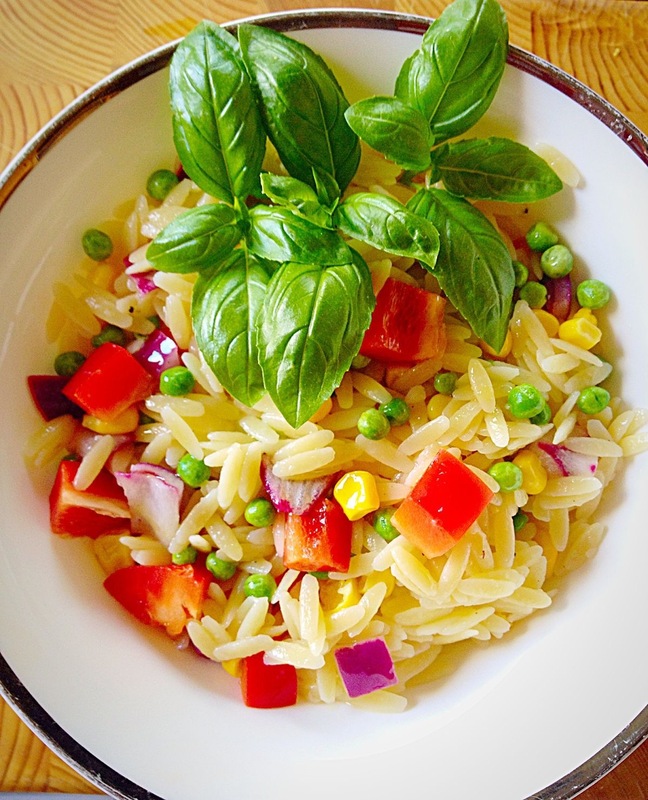 This is perfect for summer picnics! Thanks Ashley. I was amazed the difference the finely sliced lemons made. Such a lovely zing! 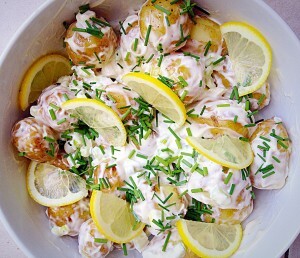 Never tried lemon with potato salad! It sure looks delicious! I’m going to have to try this! 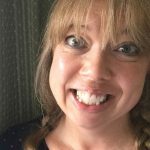 Thank you for taking time to comment. I was a bit apprehensive, but the taste together is like a flavour explosion in your mouth! The lemons have to be sliced really thinly, then you eat them with the potatoes and wow! I hope you try this. Please let me know if you do?